The saddest part of all this is that CNN would make this an issue. The only purpose of doing so is to feed the anger by some in the country. There are plenty of reasons for citizens to be angry, but this is not one of them. Shame on CNN. Those of you worried about feeding your kids or losing your jobs should not be wasting your time worrying about the price of wine at the G-20 summit. You think Obama would be serving anything less? Nope. Would this article even have been printed? Nope again. Media and miserable complainers – "GROW UP!" For Pete's sake; the president and his family don't even drink! Give it a rest. Why is this a shock? Politicians dine like this on a daily basis. Catered events and comped meals are the norm. 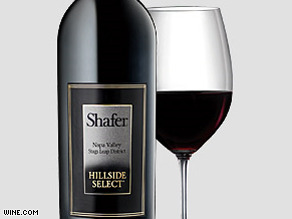 Even though Hillside Select does sell in restaurants for as much as $500, and is very hard to find. Many fine wine makers donate cases of wine to the White House every year, so they can say their wine is being served there. Chances go this wine did not cost the taxpayers anything. Wine? With the King of Saudi Arabia present? Tsk tsk. Its no wonder many journalist (and I use that word very lightly) are afraid to admit what they do when asked their occupation. This isn't news and if this is the best that Becky Brittan can do she should cover local junior high cafeterias lunches..."PrincipalAdams had two, not one, but two taxpayer lunches today for free"!!! Oh the outrage this will cause at the PTA meeting! Where is the connected story about the Obamas champagne and caviar dining during the bailout talks? Pathetic! Do you people think that someone from the WH went out and purchased this wine before the meal? It was in the White House CELLAR – i.e., already purchased. And to piggyback on what others have already said, if you were entertaining members of the G20 in your home, would you serve them Yellowtail and Velveeta & Crackers?